Those who are paying attention to what I write may recall that I don't drink alcohol. So for those who stalk me and ingest every personal detail of my life as if it provided life-sustaining nourishment and those with impeccable memories and lives of their own, it may come as a surprise that I went to a beer museum. Fortunately, this place provides an experience for those of all dispositions be it the young, liver-damaged, or simply too pious for alcohol. Personally, I do not fit into any of these categories. I just think all alcohol smells foul and have no interest in it. The view down the steps to the lower area, where all of the good times roll. The Yebisu Beer Museum is located in Ebisu in Tokyo (on the Yamanote line) and is a well-appointed place to learn a bit about the history of beer in Japan and the Yebisu brand in particular. I should note that my husband's favored brand is Yebisu and that was part of what compelled us to visit the museum and its accompanying "tasting salon". That's where the snack part of this sort of comes into play. 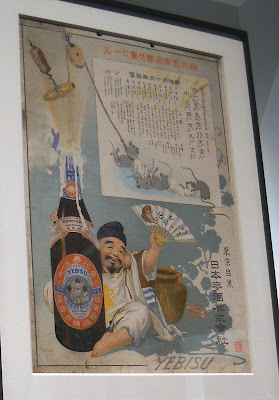 A poster showing how Yebisu used to be corked instead of using metal caps. The museum is located through Mistsukoshi department store in a wide and well-tended area populated by tony shops and restaurants and largely European-style structures. There's also a Krispy Kreme and Burger King for us plebs who can't see our way clear of paying an arm and a leg to go to Joel Rabuchon restaurant. A student of my husband's had dinner there and the meal with 2 bottles of wine was 80,000 yen (about $991, I kid you not). If you're chintzy, you can skip the wine and just eat for 40,000 yen ($495). Yebisu coins from the vending machine. The tasting salon is essentially a spacious, stripped down bar with taps. 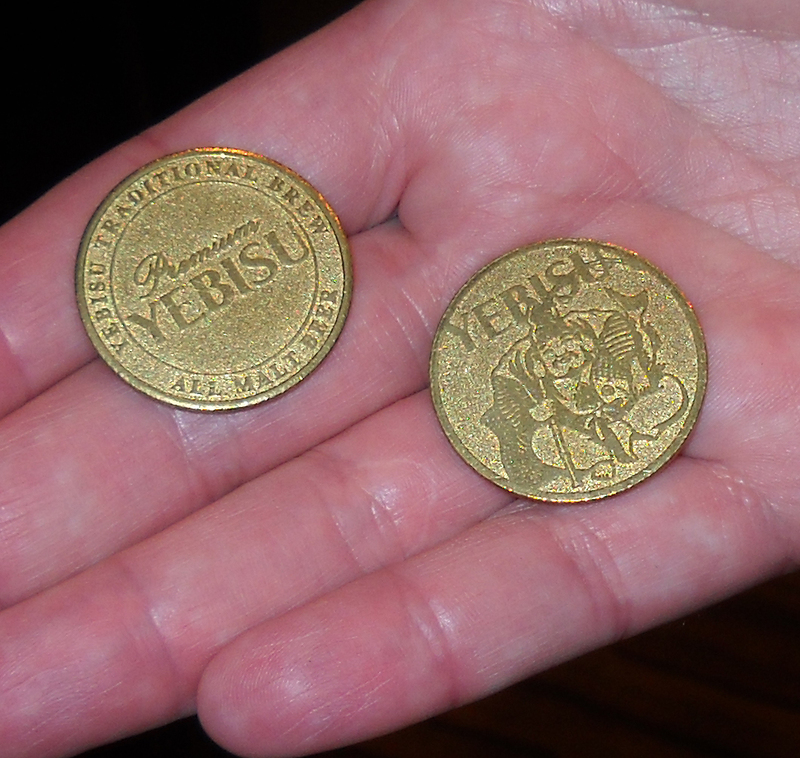 The clerks don't handle cash, so you buy tokens for 400 yen each from a vending machine. 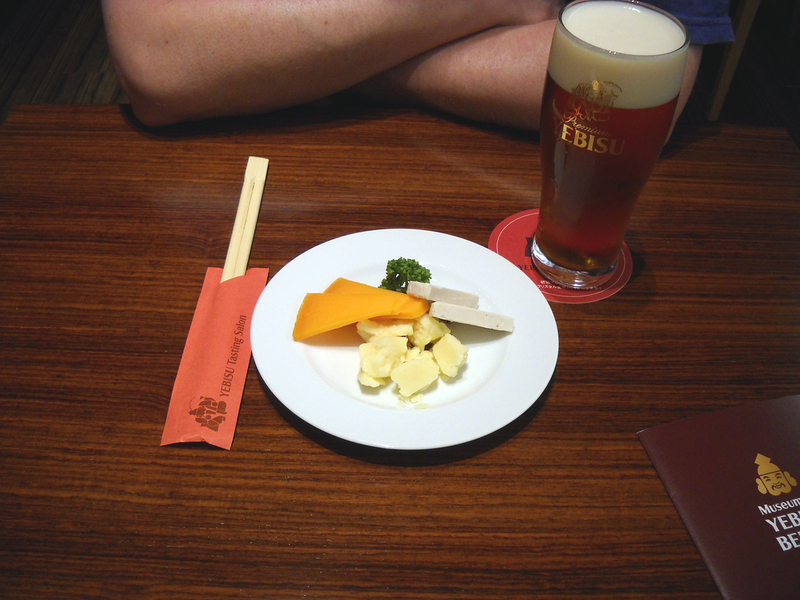 Sampling one of their beer offerings is one token, a meatier snack is two tokens, and a lesser snack is one token. My husband opted for a beer which is only available on tap at bars (which he does not frequent in Tokyo) or seasonally by the can. We also chose the cheese plate as our accompanying snack. It came with three types of cheese in small portions. One was a mild cheddar type (though I'm guessing not actual cheddar), another a crumbly, pungent, soft, salty cheese and the last a cream cheese obviously removed from a foil packet. The last one was flavored oddly and my husband wasn't keen on it. The tasting salon menu with sausages, salted snacks, Japanese pickles, cheese and tripe. Since I don't drink beer, I can't tell you how it was, but my husband enjoyed it. 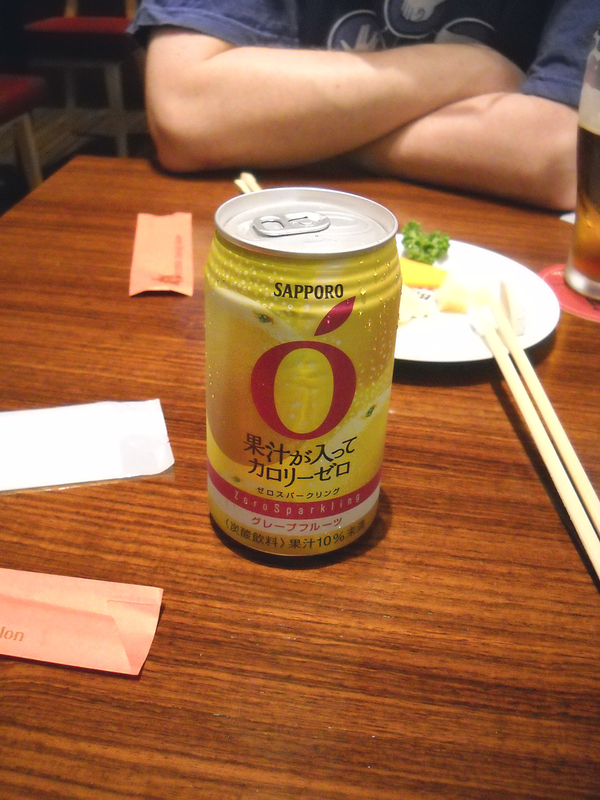 He said that Yebisu is good because it has a very clean "beer" flavor. 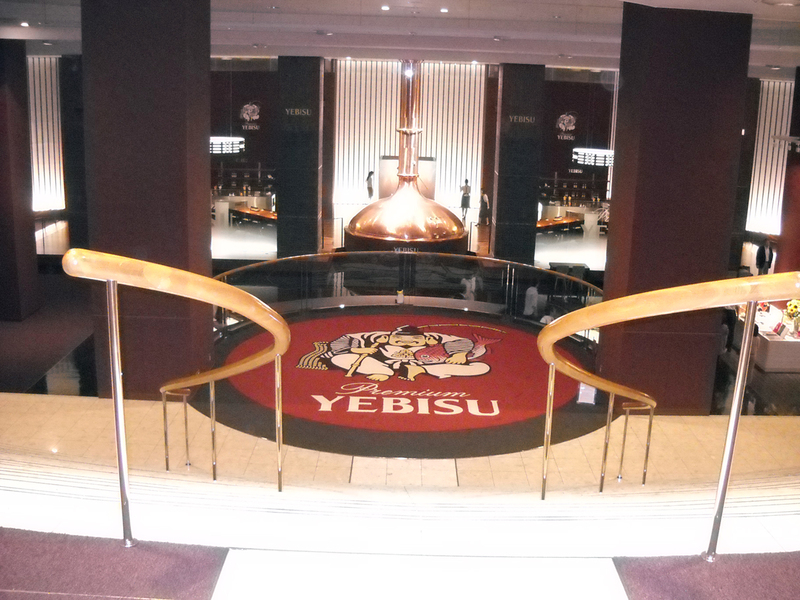 The selling point of Yebisu is that it is made on imported German equipment and is Japan's attempt to mirror that country's beer. In the past, even the ingredients were imported from Germany, but I don't know if that is still true. Since I'm not a beer drinker, I availed myself of the vending machine full of Sapporo-produced soft drinks and bought a grapefruit soda. It says it has zero calories, but actually has 17.5 calories for the entire can. The flavor was very well-balanced between the sour/bitter grapefruit and sweetness from artificial sweeteners. I couldn't even detect an aftertaste. I'd definitely pick up this refreshing drink again, though it did make an odd pairing with the real cheese we were eating. The tasting salon staff were very friendly and professional, and the atmosphere of the entire museum was quite elegant and civilized. You can take pictures anywhere in the museum, including the shop, which is quite unusual. 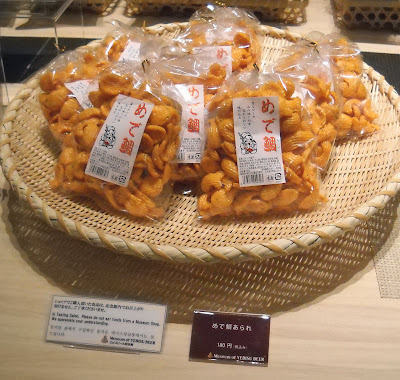 Those who are interested in snacks can find some at the museum shop, which carries Sapporo's Potekaru baked chips, some sembei and nut mixtures, and the item that I purchased, medetai chips. "Medetai" is Japanese for sea bream and these fish-shaped crackers are red to resemble that fish rather than as an indication that they are hot and spicy. They are actually quite sweet and a little bit fishy. The ingredients include wheat starch, sugar, vegetable oil, shrimp and black sesame. I can't taste the sesame, and the shrimp must be the slightly fishy bit I picked up on. They're good, but I probably wouldn't buy them again as they're too sweet for me. They are very nice and crunchy though. Even as a non-beer-drinker, I found visiting the museum a very interesting and pleasant experience. The area around the museum, Yebisu Garden Place, is wonderfully welcoming, clean and full of trees and places to sit. If you're coming to Tokyo, I'd strongly recommend giving the area a visit and hitting the museum. I may have to put this on our list when we are there in the fall. Something different --- thanks for sharing -- I always find something interesting in your posts! 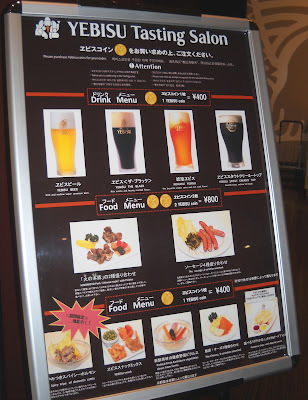 I just came back from Tokyo a couple weeks ago-- we stayed at the Westin right next to the beer museum! I must've walked past that Joel Robuchon place half a dozen times before realizing it was JOEL ROBUCHON. He's a pretty big deal if you're into gourmet food, but I think Burger King is ultimately more my speed. I went to that museum with my dad when I was 12! He sampled beer while I ate his crackers. Very tasty. We also bought some Sapporo chocolates there. I suppose they had some sort of beer flavoring. I remember that I liked them, but don't know if that's because the flavoring was well-executed or because it was CHOCOLATE! Thanks for this post :) It brought back some very foggy but happy memories. Yeah, I liked the Ebisu Beer Museum even though I'm gluten intolerant and don't drink beer. 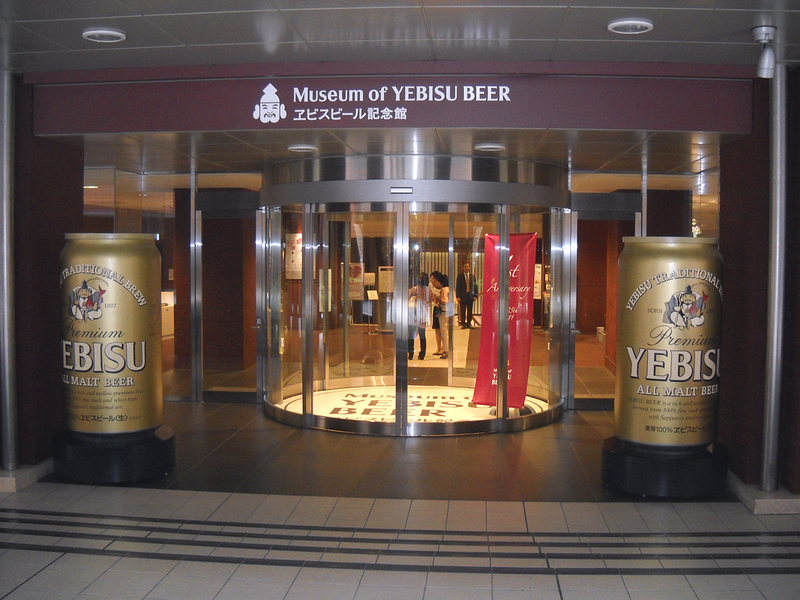 I never knew that Yebisu is an attempt to emulate German beer. Must be why I like it and can hardly drink any from the other major Japanese brewers. Hmm. What's wrong with Sapporo?